When Jeremiah Green left Modest Mouse, the question of "why would a drummer who's left his signature style stamped all over such classic material do such a thing?" arose. Truth is, Green departed one of the most original indie rock bands of the past decade to become a full-timer with Vells, another Seattle band who formed in 2002 by members of various other bands like Red Stars Theory and Stagger Lee. At the other end of the spectrum from Isaac Brock's ramblings, Vells sugarcoat jangly pop music to make one darling of an EP. Featuring six tracks led by the heavenly-voiced Tristan Marcum, this quintet mixes pretty 60s girl group hooks with Bacharach-concentrated chamber pop and the occasional haunting melody. 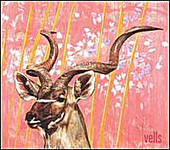 This isn't exactly the rocket science Green was doing with his former band, but Vells have stumbled into some lovely territory that should make the debut full-length a mouth-watering wait.